The Avengers: Age of Ultron movie will hit theaters on May 1st but the Avengers are already at SUBWAY! 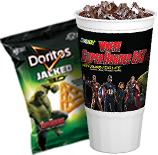 Find game codes on exclusive 30oz cups and Doritos Jacked 3D bags and enter them at promo.subway.com to play the SUBWAY Where Super Heroes Eat And Drink Too Instant Win Game! Free subs for life, movie tickets and more could be yours, instantly! A hero prevails every minute! Plus, enter 6 unique codes to unlock a collection of 8 digital character cards! 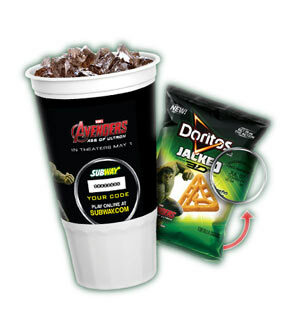 Now through May 31st, go to any participating SUBWAY restaurant and purchase a 30oz drink with a specially-marked SUBWAY promotional cup (look for the game code printed on it) or a specially-marked bag of Doritos Jacked 3D (look for the 9-13 digit number located beneath the “Guaranteed Fresh” stamp). Alternatively, you may also request a free game code, without making a purchase, between March 31st and May 18th. Simply hand print your information including your first and last name, complete mailing address, age, and valid e-mail address on a 3½” x 5″ properly stamped postcard and mail it to: SUBWAY Where Super Heroes Eat Sweepstakes Code Request, P.O. Box 251328, West Bloomfield, MI 48325. You may also get one (1) free game code, between 12:00 AM ET on May 18, 2015 and 11:59:59 PM ET on May 31, 2015 by clicking here and following the instructions or by looking for common codes on social media sites and in advertisements. Common Codes: We will list all common codes we find here so check back every day for new codes! Ready to play? Starting on March 31st, visit promo.subway.com and enter your email address to begin. If it’s your first time playing, you’ll be required to register by providing all requested information including your first and last name, complete mailing address and date of birth. Upon registering, you’ll be invited to enter your code(s) to find out if you’re an instant winner. Be sure to return each day for another chance to win and play up to 3 times daily! All codes must be entered by no later than 11:59:59 PM ET on May 31, 2015 for a chance to win. 1) Want a free game play? No superpowers needed! Just sign up to receive emails from Subway and you’ll get one (1) free chance to win. The result will be displayed instantly after you hit the “Sign Me Up” button. 2) Upgrade your meal for MORE chances to win! Upgrade your meal with a 30oz drink and choose Doritos Jacked 3D chips, you’ll get TWO game codes! 3) Got a code from a Doritos Jacked 3D bag? Enter the first 11 digits – only the digits, no spaces or characters. at least thirteen (13) years of age.